College Coach? Click here to view all of Rachel's information. I am a junior at Bozeman High School in Montana. For as long as I have wondered about my future as a player, it has been a goal of mine to play college soccer. Montana soccer players have a difficult time being seen by college coaches, so my family and I make a huge effort traveling for opportunities to guest play, attending showcases and camps. My club team pursuits higher levels of competition by scheduling matches against boys teams and college teams. My coach’s player assessments show that I am a possession player with excellent vision and precise passing. I excel at the center midfield position I suppose due to my ability to maintain composure and move the ball forward at the right time. I am usually patient while looking for opportunities to break through the final third. I consider myself a leader and a vocal player. My Montana ODP coach appointed me captain at regional’s in 2013 and I recently played for Idaho ODP at Region IV championships. I see myself as an unselfish player who loves playing through gaps to my forwards. I enjoy supporting my teammates and helping the team strive for excellence. As a student athlete, I work equally hard in school as I do on the field. Notes: I received an invitation to ODP Region IV Camp. This my forth invitation in four years. Notes: Coached by Keith Steinkoenig, scored 10 goals. 1 win, 2 draws, 1 loss. Blitzz team played well in spite of missing some key players. 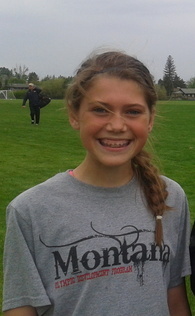 I played outside mid and center mid with Idaho ODP. We had an excellent 1-1 draw versus N. Cal and not so great 0-3 loss to E. Wash.
My Bozeman Blitzz U14 girls team won the championship and moved on to National Cup. My Blitzz club team is the only Bozeman soccer team to ever play at a National Championship. One win and two losses. We were the only team to score against the eventual champion in a 4-2 loss. Coach Hunter Terry named me captain. My Rocky Mountain FC team was co-champion. Coached by Joe Livers. My Blitzz club team had 1 win, 2 losses but we played an ECNL team in a close 1-2 result. Coached by Ed Thompkins. Disappointing 1-1-1 record. My Blitzz team dominated possession and shots but couldn't score. Coached by Ed Thompkins. Great training with top players. We played in Super Group division. 1 win, 2 losses. In the final game we played 10 v 11 for sixty minutes. We had a good share of possession and only lost by one goal. Coached by Ed Thompkins. Great camp run by coach Markus Roeders. Very hot conditions but enjoyed being coached by Rich Manning and assistants. I participated as a guest player for Washington Timbers 98G Reds (3 wins, 1 loss). I scored the winning goal in 3rd game. Coached by John Samwel. Very good experience with excellent competition and many college coaches in attendance. A very productive weekend for my myself and my Montana teammates. Montana ODP coach Keith Steinkoenig told me during my player assessment that the coaches awarded me the highest rating of all field players in attendance. Two draws and 1-2 loss. One draw and three losses. Although none of our losses were blowouts, these opponents are the best that we have faced this year. 2 wins and 1 loss. Our 3-2 loss was very disappointing as we had a 2 goal lead until late in the first half. Championship game eliminated due to weather. We were undefeated. I scored a goal in each of the first three games and three goals in the final game. We ended up 1-1-1 in spite of serious handicap from injuries and lack of subs. I scored tying goal of third game. Our backup goal tender was asked to play striker. 2004-'08 Blitzz Micro Soccer Program and Blitzz Academy, 2009-2014 Blitzz Girls compete in league play and travel to regional events. ODP Region IV Camp: '12, '13, '14 (named captain for '14 regional championship). Year round soccer related training. Between soccer seasons, I routinely work out at gym with trainer doing strength & agility. During winter months, I play Futsal 3 days a week and train with ball indoors.